The northernmost part of Landstrasse adjacent to the 1st district is definitely worth considering. This is the beginning of the 4th district, a very sought after neighbourhood with its palais. This is the city's diplomatic quarter and a desirable residential area, although it is no longer as fashionable as it used to be. Located close to the Schwarzenbergplatz Square, the quarter is marked by elegant houses, classy hotels and expensive restaurants. It is still in demand, but very expensive. The Stadtpark and the Belvedere Garden are found nearby. The area is highly central, just a short distance to Innere Stadt. It has a key transportation hub nearby: the city's main railway station, Wien-Mitte (Vienna Central), which includes the City Air Terminal that offers direct rail service to the airport. The attractive Rochusmarkt market is also close by, and offers a shopping alternative to the further-off Naschmarkt in Wieden. Landstrasse has a number of important Vienna attractions, most notably the beautiful Belvedere palace and museum, which houses the National Gallery of Austria. Other sites of interest here include the Kunsthaus Wien art museum, the Heeresgeschichtliches museum of military history, the Weiner Konzerthaus concert hall, and the St. Marxer Friedhof Cemetery where Mozart lies buried (although no one knows his exact burial spot). Interestingly, the area around the cemetery is populated by biotech corporations and other research-oriented companies. Landstrasse is not the most fashionable district of Vienna, and outside of the diplomatic quarter, you will not find many trendy places (that is, hip bars, restaurants, or boutiques). Landstrasse is mostly made up of communal living blocks with nothing of great interest to offer. 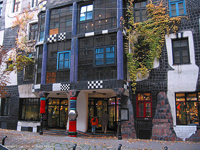 An exception is Hundertwasserhaus, an apartment block notable for its highly eccentric (even outrageous) design. It is closed to visitors, however; but you can get a similar flavor from the nearby Kalke Village shopping area designed by the same artist, Friedensreich Hundertwasser.